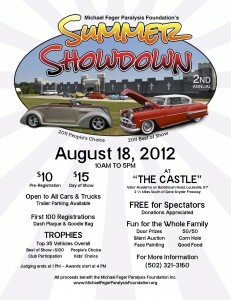 The 2nd Annual Summer Showdown Car Show hosted by the Michael Feger Paralysis Foundation. Saturday August 18, 2012 from 10am to 5pm. At Valor Traditional Academy “The Castle”. FREE for Spectators! Pre-Registration before July 28th is $10. Day of Show is $15. First 100 vehicles to register will get Dash Plaque, Door Prize Ticket and Goodie Bag. Trophies will be given to the Top 35 Cars/Trucks. Special Trophies include Best of Show +$100, People’s Choice, Kid’s Choice and Club Participation. Professional Judging will end at 1pm and Awards start at 4pm. We will also have the music, food, 50/50 and face painting for the kids. All proceeds benefit Michael Feger Paralysis Foundation Inc.